The percentage is equal to the amount of fat in the milk according to weight. Whole milk is approx. 3.5% fat and is the closest to the way it comes naturally from the cow. 2% milk contains around 2% fat by weight, 1%.. you get it. Here’s how they do it: Before milk is bottled, all the fat is removed, then re-combined with the milk in various percentages. Consuming at least 3 servings of milk, cheese, yogurt or other foods rich in calcium, promotes bone health, especially in children. Due to minimal protein contained in almond, coconut and rice milk as well as fewer calories and lower fat, these are not good alternatives for your baby within the two years of life. Babies brains are still developing from birth to two years of age and require more calories and fat. ♦ Calcium is associated with a reduced risk of Type 2 diabetes, heart disease and can even lower blood pressure in adults. For vegans, soy milk is the closest alternative to cow’s milk regarding calories, protein and calcium. Did you know you can get calcium from vegetables too? 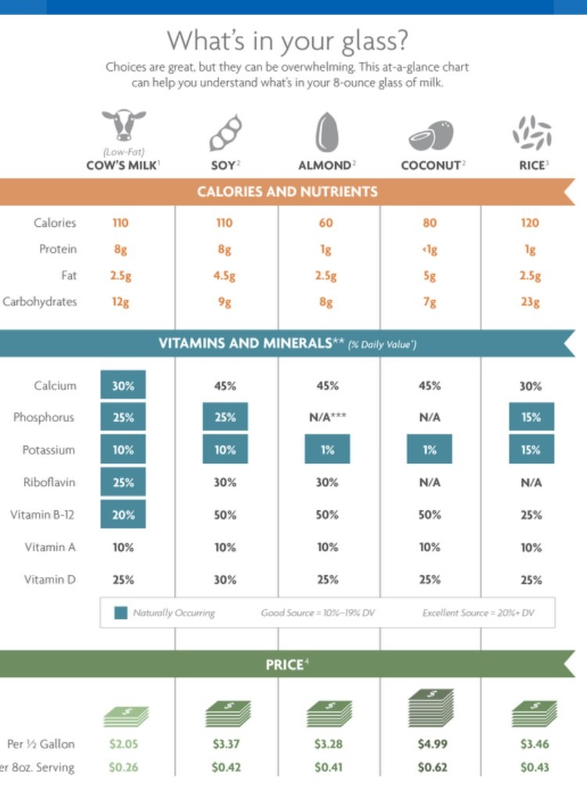 The bioavailability of calcium, or ability of the body to absorb the nutrient, in cauliflower, watercress, brussels sprouts, rutabaga, kale, mustard greens, bok choy, broccoli and turnip greens is actually higher than milk products at greater than or equal to 50% absorption! Other foods that contain substantial amounts of calcium are tofu, small fish with bones like sardines and even blackstrap molasses! Milk products also contain Vitamin D. The combination of calcium and vitamin D are essential to achieving peak bone mass and decreasing risk of osteoporosis. Vitamin D also helps the body maintain adequate calcium levels by modifying calcium absorption. Why do they label whole milk jugs “Vitamin D milk” ?…I do not know! All milk, including reduced fat and fat-free milk contains vitamin D!!! All cow’s milk, no matter the fat content contains the same 9 essential nutrients (nutrients required for normal physiological function that the body does not synthesize and must be obtained from food). If you’re reading this and you are a grown up drinking whole milk.., WHY ARE YOU DRINKING WHOLE MILK?! Whole milk is for babies! If you are an overweight adult and you drink whole milk, this is a good place to start! You don’t have to go from whole milk to skim all at once. Gradually work your way down to skim. You will save yourself a lot of unnecessary calories and fat! Now that you’ve identified how much calcium you need each day, how do you achieve your goal? Web site lists the nutrient content of many foods and provides comprehensive list of foods containing calcium arranged by nutrient content and by food name. ** Calcium content varies slightly by fat content; the more fat, the less calcium the food contains. *** Calcium content is for tofu processed with a calcium salt. Tofu processed with other salts does not provide significant amounts of calcium. In its food guidance system, MyPlate, the U.S. Department of Agriculture recommends that persons aged 9 years and older eat 3 cups of foods from the milk group per day . A cup is equal to 1 cup (8 ounces) of milk, 1 cup of yogurt, 1.5 ounces of natural cheese (such as Cheddar), or 2 ounces of processed cheese (such as American). If you are a diabetic, one serving (8 oz) of milk contains 12 grams of carbohydrates and counts as one carbohydrate exchange. ♦if your baby is at risk for becoming overweight, the American Academy of Pediatrics recommends switching to a lower-fat milk before the age of 2. If you choose not to provide milk to your baby after introducing solid foods beginning at 6 months, or are raising your child vegan, speak with your pediatrician or a dietitian to ensure that you are providing everything your baby needs to grow and develop. Milk is also an excellent source of potassium. Potassium prevents high blood pressure, maintains fluid and electrolyte balances, supports cell integrity and assists with nerve impulse transmission as well as muscle contractions. Along with being a good source of calcium, vitamin D and potassium, milk contains vitamin A. Vitamin A is needed for good vision, plays a role in protein synthesis and cell differentiation which maintains the health of epithelial tissues and skin. Vitamin A also supports reproduction. If you feel overwhelmed by all the nutrition advice, calorie recommendations and diet trends, read these: Fact. Not Fad., Let’s Crunch Numbers!, Help Me To Help You! Thank you for explaining the all the different choices of milk. 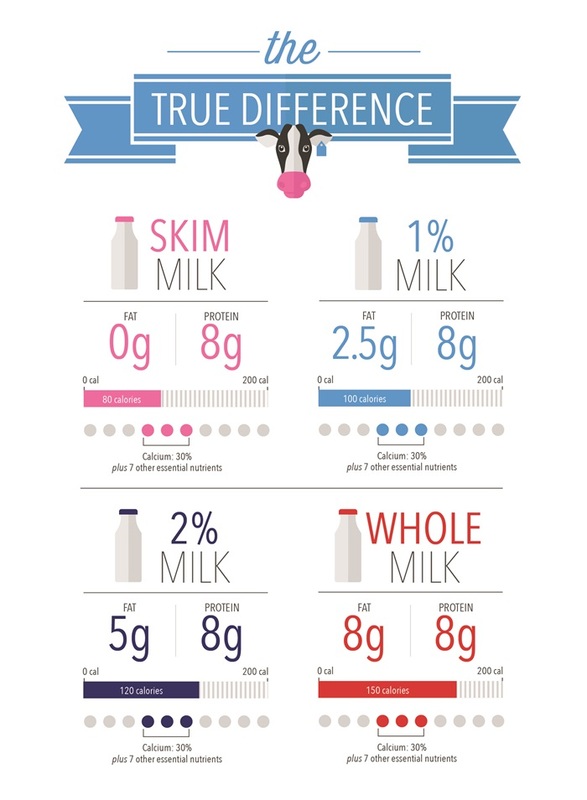 It would be easier if they prominently labled the different types as 0, 2.5, 5 and 8 g milk.